In Southwestern Pa., Two Conservative Democratic Incumbents Fight For One Seat : It's All Politics To get elected in southwestern Pennsylvania as a Democrat, it helps to be a conservative one. And because of congressional reapportionment, two conservative Democratic incumbents — Rep. Jason Altmire and Rep. Mark Critz — are facing off for a single seat in their party's primary later this month. To get elected in southwestern Pennsylvania as a Democrat, it helps to be a conservative one. And because of congressional reapportionment, two conservative Democratic incumbents are facing off for a single seat in their party's primary later this month. Rep. Jason Altmire and Rep. Mark Critz, who are vying for the state's 12th District seat, each oppose abortion rights and favor gun rights. Their race on April 24 may come down to the few issues that do distinguish the two congressmen. Pennsylvania is one of the states losing a seat in Congress because of reapportionment. Republicans controlled the redrawing of the congressional district maps and decided to lump two Democratic incumbents into the same district. That leaves Democrats in Pennsylvania's 12th Congressional District with a tough choice. Altmire is perhaps the more polished of the two candidates. 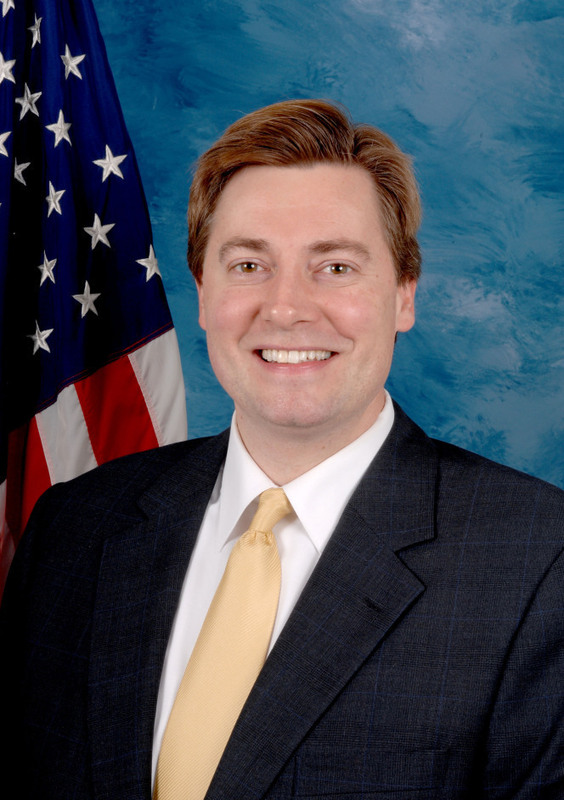 His 4th District, where he has been elected three times, has been the northern suburbs surrounding Pittsburgh. As he points out, the newly drawn 12th District contains many of the voters he's represented for the past six years. "I think the fact that I represent two-thirds of the people that live in the combined district — they know me, they know my record — that's going to give me the advantage in getting to meet voters and have them understand what I'm all about," said Altmire, who met Wednesday with seniors at a community center in Plum, Pa. The senior center has had some recent renovations, thanks to a $300,000 federal grant Altmire helped secure. The seniors' big concerns are, not surprisingly, Medicare and Social Security, programs that Altmire, a former health care executive, pledges he will continue to protect. "That's one of the reasons that I support a balanced budget," Altmire said, speaking at the senior center. "Every family, every business in America has to balance their own budget. It's overwhelmingly popular because it's simple — and only in Washington would you hear people saying that balancing the budget is gonna hurt our economy." Retired veteran Jeff Pope makes clear he's with Altmire all the way. "There's no comparison between him and Mark Critz," said Pope. "I've been in his corner from Day 1. He does more for the military man and the military veteran than any other congressman we have. So he will always have my vote." In a TV ad, Altmire concedes he and Critz share some common ground but adds that there are some "big differences," as well. 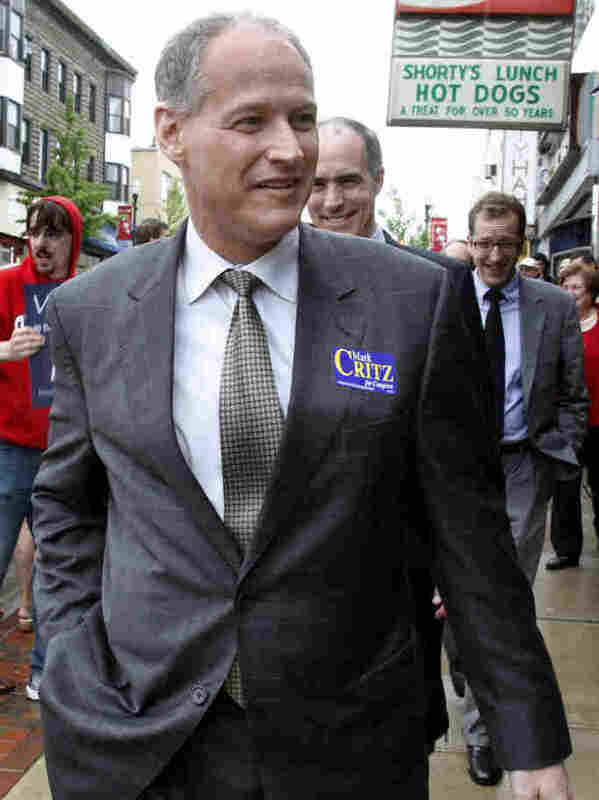 Mark Critz in 2010, while campaigning in Washington, Pa., during a special election to fill the seat vacated after the death of his former boss, Rep. John Murtha. He says that Critz "voted with the Republicans against reforming Wall Street and ... didn't vote against the Tea Party budget that would dismantle Medicare and gut Social Security." Critz has responded with his own ad, attacking Altmire's support for the balanced-budget amendment, saying it would hurt rather than help seniors. Critz is the successor to his former boss, the late Democratic Rep. John Murtha, who brought countless federal projects and contracts to his Johnstown-based district. His name can be found on everything from the John P. Murtha Neuroscience and Pain Institute to the regional airport. But much of that district is now gone, and Critz must introduce himself to new voters. At a campaign appearance at the East Hills Senior Center in Johnstown, he signed a big mock-up of a Social Security card, pledging to "stand firm and strong to make sure that Social Security and Medicare" are never used as bargaining chips in budget negotiations. The endorsement Critz won Thursday from former President Bill Clinton may be a key to the race. "If you want to send a Democrat into southwestern Pennsylvania to stand up for you, to give you an endorsement, it would certainly be Bill Clinton, who is very popular in that part of Pennsylvania," said Terry Madonna, a political scientist at Franklin & Marshall College. The race is likely to hinge on whether Critz's endorsements and his get-out-the-vote effort can overcome Altmire's geographical advantage. This much is certain: There will be one fewer conservative Democrat in the already polarized Congress next year.